The Arctic Ocean is warming at two to three times the global rate and is experiencing accelerated ice loss with a historical minimum reached in the summer of 2012 (Parkinson and Comiso, 2013). Furthermore, it is predicted to be free of ice during the summer as early as 2050 (Intergovernmental Panel on Climate Change [IPCC], 2014). Due to the higher solubility of CO2 in cold waters, polar regions are particularly vulnerable to ocean acidification by anthropogenic CO2 (Shadwick et al., 2013). The Arctic Ocean is characterized by very low concentrations of pCO2 < 200 μatm in the spring and early summer due to high net primary productivity (Takahashi et al., 2002; Vaquer-Sunyer et al., 2013). However, increased atmospheric pCO2 is expected to reach values ≥1,000 μatm by 2,100 (Meehl et al., 2007; United States Environmental Protection Agency [USEPA], 2013), while enhanced air-sea fluxes with decreasing ice cover (Bates et al., 2006) will result in increased pCO2 uptake in Arctic water, with thresholds for carbonate saturation states predicted to be reached as early as 2020 (Popova et al., 2014). Previous experimental studies have shown, that warming (beyond a threshold of 5°C) triggers a decrease of phytoplankton biomass and net primary production in the Arctic (Holding et al., 2013; Coello-Camba et al., 2015). This will favor an increase of bacterial growth which is translated in excess community respiration over gross primary production (Holding et al., 2013). Then, a major effect of warming produce changes in the plankton carbon flow pattern, enhancing bacterial processing of DOC (and resulting increased CO2 production). This has been confirmed by many other experimental studies (e.g., Wohlers et al., 2009). In addition, experimental and in situ results point out that CO2 increase may fertilize planktonic primary producers in the European Arctic Ocean (Engel et al., 2013), however, the effect is temperature dependent (Beardall et al., 2009). Recently, Coello-Camba et al. (2014), Holding et al. (2015) and Sanz-Martin et al. (2018) showed that CO2 has a fertilizing effect on primary production at lower temperatures but that effect become negligible at increasing temperatures. These drivers act in opposite directions, with CO2 enhancing primary production while temperature affecting primary production negatively (Keys et al., 2018). 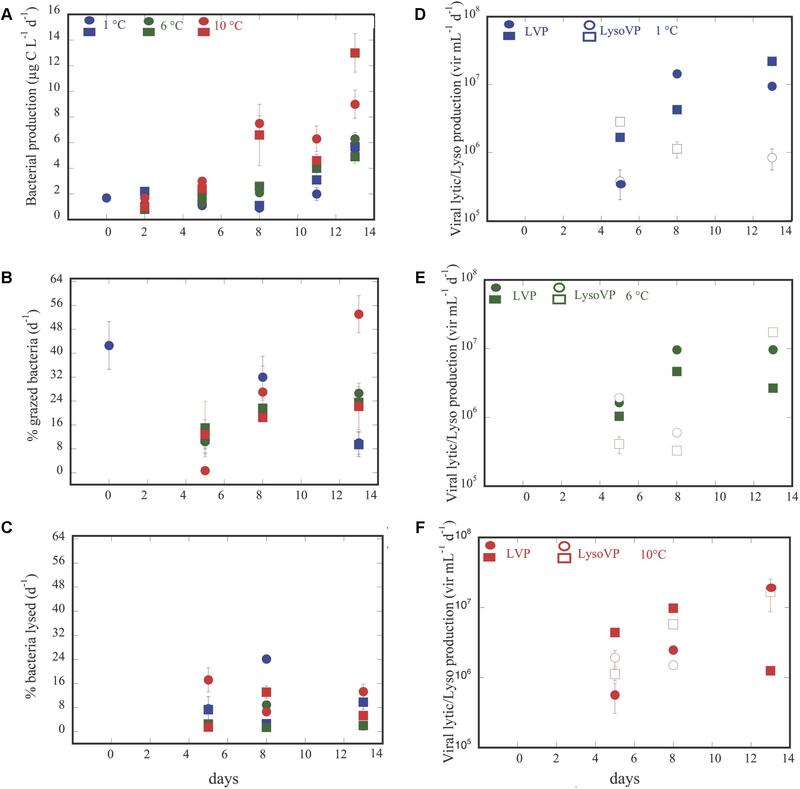 A positive effect of increasing temperature and pCO2 on marine bacterial communities is also observed, favoring their growth as a consequence of selecting different more active phylotypes (e.g., Lindh et al., 2013; Piontek et al., 2013). Furthermore, it has also been assessed that the increases of bacterial production (BP) due to warming, triggers greater bacterial carbon transfer to higher trophic levels rather than the flux of dissolved organic carbon from bacteria lysed by viruses (Lara et al., 2013; Maranger et al., 2015). This could be due to the observed success of lysogeny respect to lysis in warming conditions (Lara et al., 2013). Nevertheless, there is still limited information available on the interacting effect of increasing CO2 concentrations and temperature on mortality (grazing due to protists vs. rate of lysed bacteria by viruses) and even less knowledge of its effects on the viral life style (lytic versus lysogeny). Based in the above information in our study, we will expect after applying these two stressors on the whole microbial planktonic community, an increase of BP mainly at higher temperatures, followed by an increase of grazing rates by protists. Bacterial mortality rates due to viruses, will depend on lytic -lysogenic infection cycle, where according to Jiang and Paul (1994), lysogenic infection should prevail over lytic production in oligotrophic conditions with low BP, while lytic infection should increase when BP is high. Here, we examined the responses of phytoplankton biomass and heterotrophic microbial communities, including viruses, to the concurrent changes in warming and CO2 increase, attempting to discriminate whether they may have a direct or synergistic effect. To unravel the interactive effect of both temperature and CO2, we used experimental 20 L microcosms to assess the changes of phytoplankton and heterotrophic microbial abundances and processes (BP and mortality) in water from a high-Arctic fjord (Svalbard). We continuously bubbled CO2 (ranging from 135 to 2318 μatm) in three controlled temperature treatments (1, 6, and 10 °C). The chosen range for temperature covered the projected increases plus 2–3°C expected in the Arctic fort the coming century (ACIA, 2004). 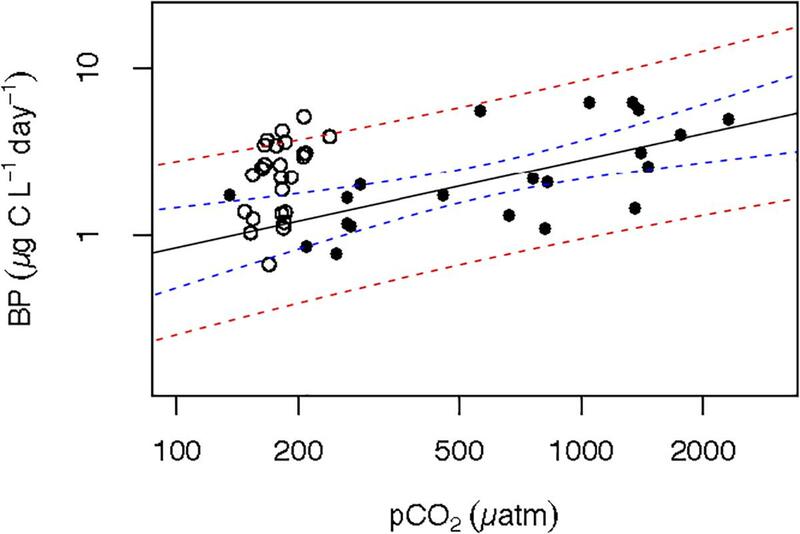 For CO2 the low range was chosen much lower than present day CO2 concentrations, as pCO2 in Arctic waters is often undersaturated compared to pCO2 in the atmosphere, and it is not uncommon to find values of 150 ppm. The high range was not necessarily selected, but just consequence of controlled CO2 increase plus respiration inside the mesocosms resulting in a high range. While it is far from expected concentrations by the end of the century (United States Environmental Protection Agency [USEPA], 2013) it is also an experimental extreme case scenario, which is interesting to determine overall trends. Then, under these experimental conditions we evaluated the relationship between phytoplankton biomass (i.e., chlorophyll a concentration, and phototrophic pico/nanoflagellates abundance) and BP, and its fate (i.e., grazing on bacteria by protists, rates of bacterial lysis) as well as viral infection type (lytic vs. lysogeny). Finally, in order to confirm the consistency of our experimental results we compared the BP obtained at increasing pCO2 and temperature with available field data (from the Greenland Sea and North of Svalbard; Boras et al., 2010) and pCO2 data from Alvarez (unpublished) during the ATOS-I cruise. Seawater for the experiment was collected on June 23, 2010 just outside of Isfjorden Svalbard (78.0826° N, 13.4734° E) aboard R/V Viking Explorer. Seawater was pumped on board from a depth of 1–2 m (salinity: 33.50; temperature: 1.41°C), filtered through 200 μm in order to avoid large zooplankton and distributed in 60 L carboys previously treated with 0.1 N HCl for at least 48 h and thoroughly rinsed with seawater from the same sampling site. Seawater from different carboys (60 L) was pooled together in larger tanks (280 L) and transferred to acid-washed 20 L clear polycarbonate NalgeneTM bottles, which served as the experimental microcosms. The experiment was conducted in a temperature regulated cold room (set at 4.5 ± 1°C) at the University Center in Svalbard (UNIS), Longyearbyen. The experimental design consisted of six replicated 20 L microcosms of three levels of temperature treatments (1, 6, and 10°C), a total of 18 microcosms, into which we constantly bubbled CO2 gas (Supplementary Figure S1). The eighteen 20 L bottles were submerged in nine 280 L tanks where experimental temperature was regulated by a temperature control unit (PolyScience 9600 series, precision 0.1°C) and held stable over the 13 experiment days (1°C: 1.8 ± 0.4°C; 6°C: 6.7 ± 0.7°C; 10°C: 10.3 ± 0.5°C). Afterward, the 6 microcosms replicates for each temperature treatment were divided in half, receiving bubbled air from two sets of mass flow controllers (Aalborg GFC17), (Supplementary Figure S1), which regulated a mixing ratio of gasses (CO2 + air mixture). Each of the two mass flow controllers was split into 3 tubes for each temperature treatment, and each of which was split again into 3 to accommodate each microcosm replicate in each temperature treatment. This allowed for 2 groups of three true replicates in each temperature treatment (Supplementary Figure S1). In each of the two groups of triplicates for each temperature treatment we tried to establish “Low” and “High” CO2 treatments. However, the mean (±SE) pCO2 along the duration of the experiment in the “Low” CO2 treatment was: 358.9 ± 38.9 μatm at 1°C, 640.5 ± 60.2 μatm at 6°C, and 559.4 ± 69.1 μatm at 10°C; whereas in the “High” CO2 treatment, was: 1127.5 ± 93.4 μatm at 1°C, 986.4 ± 228.5 μatm at 6°C, and 1014 ± 217.7 μatm at 10°C. Due to this high variability in pCO2 for “Low” and “High” conditions, pCO2 was treated as a continuous variable with a gradient-basis design (Holding et al., 2015), ranging from 135 to 2318 μatm, and temperature as a fixed variable. This allowed to perform analyses of covariance to determine interactions between CO2 and temperature. Ambient air was collected via aquarium pumps, stripped of CO2 by passing through soda lime columns, and mixed with CO2 gas before it was delivered to the microcosms via impermeable Tygon tubing. Microcosms were aerated with air-CO2 mixture continuously via 5 mm diameter PTFE tubing. Airflow was adjusted using Hoffman clamps so as to avoid introducing turbulence to the microcosms; bubble size was manually controlled to be no larger than approximately 7 mm diameter (for more details see Holding et al., 2015). All plasticware used for bubbling directly into the microcosms was previously cleaned with HCl and thoroughly rinsed with seawater. Finally, the set up was completed with two fluorescent light tubes per tank (200 μmol photons s-1 m-2 determined using a 4π LI-193 LI-COR radiation sensor) providing a continuous 24 h light environment, thereby simulating the Arctic summer natural conditions. Total hydrogen ion (pHT) concentration of the seawater was measured spectrophotometrically using the indicator dye m-cresol purple (Sigma-Aldrich), according SOP6b, while total alkalinity (TA) was determined using open-cell titration following the SOP3b from Dickson et al. (2007). TA and pHT measured at standard temperature and pressure, along with nutrient concentrations were used as input in the CO2SYS (Pierrot et al., 2006) program to calculate output carbon parameters (pHT, pCO2 in μatm, and tCO2 μmol kg-1), which were standardized to the average tank temperatures measured each day (for more details, see Holding et al., 2015). During the ATOS-I cruise, pCO2 was determined using a high-precision (±1 μatm) non-dispersive infrared gas analyzer (EGM-4, PP-systems), averaging measurements at 1 min recording interval. The closed gas stream flowing through the gas analyzer was previously equilibrated with the sampled surface seawater using a gas exchange column (MiniModule 1.25 × 9 Membrane Contactor, Celgard). Temperature was measured in the continuous system just before the EGM-4 and in the seawater inlet and corrected accordingly. Before entering the gas analyzer, the gas stream was circulated through a Calcium Sulfate column to avoid interferences from water vapor. The gas analyzer was calibrated, in this cruise, using two dry standards: pure nitrogen (0.0 μatm CO2) and a gas mixture of CO2 and N2 containing a CO2 molar fraction of 541 μatm, from Carburos Metalicos (Barcelona, Spain), which revealed an accuracy of ±2 μatm in the determinations of pCO2. From each microcosm, subsamples for chlorophyll a (Chla) concentration were collected daily. A volume of 50 ml was taken for each microcosm, subsequently filtered through Whatman GF/F filters and extracted using 90% acetone for 24 h, after which the concentration was measured fluorometrically following Parsons et al. (1984). Subsamples of 2 ml were collected daily for viral abundance from each microcosm, fixed with glutaraldehyde (0.5% final concentration), refrigerated, quick frozen in liquid nitrogen and stored at -80°C as described in Marie et al. (1999) and Brussaard (2004). Counts were made using a FACSCalibur flow cytometer (Becton and Dickinson) with a blue laser emitting at 488 nm. Samples were stained with SYBR Green I and run at a flow rate ranging from 0.061 to 0.077 ml min-1. Samples of 150 ml for bacteria and protists abundance were collected from each microcosm at 0, 2, 4, 5, 8, 11, and 13 days for bacteria, and at 0, 5, 8, 11, and 13 days for pico/nanoflagellates. Subsamples of 10 and 20 ml for bacteria and pico/nanoflagellate (phototrophic and heterotrophic) abundance, respectively, were fixed with glutaraldehyde (1% final concentration), filtered through 0.2 and 0.6 μm black polycarbonate filters, respectively, and stained with DAPI (4,6-diamidino-2-phenylindole) (Porter and Feig, 1980) to a final concentration of 5 μg mL-1 (Sieracki et al., 1985), and counted by epifluorescence microscopy (Olympus BX40-102/E, at 1,000×). Pico and nanoflagellates showing red-orange fluorescence and/or plastidic structures in blue light (B2 filter) were considered phototrophic forms (PF), while colorless flagellates showing yellow fluorescence were counted as heterotrophic pico/nanoflagellates (HF). Finally, 100 ml samples were fixed with acidic lugol (2% final concentration) to estimate ciliate abundance and the abundance of the phagotrophic dinoflagellate Gyrodinium sp. Aliquots of the fixed samples (50-100 ml) were sedimented for 24–48 h before enumeration. Both the ciliates and Gyrodinium sp. were counted in an inverted microscope (Zeiss AXIOVERT35, at 400×). BP = Leu × CF [μg C L-1 d-1], where Leu is the 3H-leucine incorporation (pmol L-1 d-1), and CF is the conversion factor (1.5 kg C mol Leu-1) (Kirchman, 1993). Measurements of lytic viral production (LVP), lysogenic viral production (LysoVP), bacterial mortality due to protists (grazing rates, GZ) and viruses (bacteria lysed by viruses, BLV) were done at the beginning (only for GZ) and at 5, 8, and 13 days of the experiment for all treatments. Bacterial mortality due to protists was evaluated following the fluorescent-labeled bacteria (FLB) disappearance method (Sherr et al., 1987; Vázquez-Domínguez et al., 1999). Eighteen 1.5-L sterile bottles were filled with 0.5-L aliquots of seawater from each of the experimental microcosms. For each temperature treatment, we added an extra bottle filled with 0.5 L, 0.2 μm filtered water (grazer-free water) as a control. Then for each temperature treatment we obtained two group of triplicates, where each microcosm was bubbled with CO2 from the corresponding mass flow system (Supplementary Figure S1). Each bottle was inoculated with FLB at 20% of the natural bacterial concentration. The FLB were prepared with a culture of Brevundimonas diminuta1 following Vázquez-Domínguez et al. (1999). Bottles were incubated in the tanks in the dark (covered with a black plastic bag) for 48 h at the same experimental temperature as the corresponding microcosms. To assess the bacterial and FLB abundance, samples were taken at the beginning and at the end of the grazing assay. Abundances of bacteria and FLB were assessed by epifluorescence microscopy as explained above. Natural bacteria were identified by their blue fluorescence when excited with UV radiation, while FLB were identified by their yellow–green fluorescence when excited with blue light. Control bottles showed no decrease in FLB at the end of the incubation time. Grazing rates of bacteria were obtained according to the equations of Salat and Marrasé (1994), for details see Lara et al. (2013). To gather a large enough water volume to measure viral production and rate of lysed bacteria by viruses, we pooled together 0.5 L subsamples from each of the two triplicates for each temperature treatment submitted to the corresponding bubbling of CO2. We used the virus-reduction approach (Weinbauer et al., 2002; Wilhelm et al., 2002). Briefly, the 1.5-L subsamples were prefiltered through a 0.8 μm pore size cellulose filter (Whatman), and then concentrated by a spiral-wound cartridge (0.22 μm pore size, VIVAFlow 200), obtaining 50 ml of bacterial concentrate. Virus-free water was collected by filtering 0.5 L of seawater using a cartridge of 30 kDa molecular mass cutoff (VIVAFlow 200). A mixture of virus-free water (150 ml) and bacterial concentrate (50 ml) was prepared and distributed into four sterile Falcon plastic tubes. Two of these tubes were kept without any manipulations as controls, whereas in the other two, mitomycin C (1 μg mL-1 final concentration, Sigma) was added as the inducing agent of the lytic cycle. All Falcon tubes were incubated in the dark for 12 h inside the tanks at the same temperature as the microcosm. Samples for viral and bacterial abundances were collected at time zero and every 4 h of the incubation, fixed with glutaraldehyde (0.5% final concentration) and stored as described for viral abundance. Viruses and bacteria from the viral production experiments were counted by FACSCalibur flow cytometer (Becton and Dickinson), following Gasol and Del Giorgio (2000) and Brussaard (2004), respectively. The number of viruses released by the bacterial cell (burst size, BS) was estimated from viral lytic production measurements, such as in Middelboe and Lyck (2002) and Wells and Deming (2006). The estimated BS ranged from 9 to 500 (168 ± 42) viruses per bacterium. These high values of BS are comparable to the ones observed by TEM in Arctic waters by Steward et al. (1996). Rate of lysed cells was determined as previously described by Weinbauer et al. (2002), and Winter et al. (2004). Briefly, an increase in viral abundance in the control tubes represents lytic viral production (LVP), and the difference between the viral increase in the mitomycin C treatments (total viral production, VP) and LVP gives the LysoVP. As part of the bacteria could be lost or increase during the bacteria concentration process, the LVP and LysoVP were multiplied by the bacterial correction factor to compare both viral production values from different incubation tubes. This factor was calculated by dividing the in situ bacterial concentrations by the T0 bacterial abundances in both viral production measurements (Winget et al., 2005) and ranged between 0.9 and 19.8. We then calculated the rate of bacteria lysed by viruses (BLV, cells mL-1 d-1) by dividing LVP by the burst size (BS), as described in Guixa-Boixereu (1997). The BLV was used to calculate bacterial losses by viruses as a percentage of the bacterial standing stock (BA). BABLV = (BLV ∗ 100)/BA0 (% d-1), where BA0 is the initial bacterial abundance in situ. When necessary, data were log-transformed to meet normality and homoscedasticity assumptions of the test used. We averaged the microbial abundances from the six triplicates to describe its changes over time, since we did not find significant differences between the 2 groups of true replicates when applying a T-test. Then, we tested the differences of each microbial abundances (covering the whole experiment, and for each week, separately) among the three temperatures by one-way ANOVA analyses. Regression analysis was used to describe: (i) the relationships among heterotrophic microbial processes (BP, bacterial mortality due to protists and viruses, and viral lytic and lysogenic production) covering the whole range of pCO2 for each temperature individually; and (ii) the relationships among microbial parameters (processes and abundances) from the corresponding triplicates temperature treatments and CO2 bubbling. General linear models were used to determine the possible interactions of pCO2 and temperature on heterotrophic microbial processes. A 95% confidence intervals for the relationship between pCO2 and BP were also estimated. All analyses were performed with the JMPTM and the statistical software R© (Version 3.4.3, 2017). Abundances of microorganisms along the experiment for the three temperature treatments showed similar dynamics over the 1st week, while the main differences were detected after day 6 through the end of the experiment (Figures 1B–H and Supplementary Table S1). Chlorophyll a (Chla) concentration, presented significant differences across temperatures, over the first as well as in the 2nd weeks (Figure 1A and Supplementary Table S1). Bacterial abundance did not vary too much among the three temperature treatments (Figure 1B p > 0.05 and Supplementary Table S1), although, we detected occasionally higher values in the 6° than in the 1 and 10°C treatments after day 5 up to day 11, while opposite trends in Chl a concentration were observed in the 6 and 10°C treatments. Viral abundance displayed rather similar values across treatments for most of the duration of the experiment. Nevertheless, during the 2nd week we detected significantly higher viral abundance at 6°C (Figure 1C p < 0.0001 and Supplementary Table S1), whereas bacterial abundance displayed opposite high and low values at 1 and 6°C at the end of the experiment. Consequently, the increase of viruses and decrease of bacteria at 6°C, during the 2nd week, lead a VBR also significantly higher at 6°C (Figure 1D, p < 0.05). Phototrophic (PF) and heterotrophic (HF) pico/nanoflagellate abundances followed similar trends increasing at the end of the experiment in the 6°C treatment. Both PF and HF showed significantly higher values in the 6° than in the 10 and 1°C treatments during the 2nd week (Figures 1E,F and Supplementary Table S1). Abundances of ciliate and Gyrodinium sp. displayed an opposite trend than PF and HF over time. During the 2nd week, both of them showed significantly higher values at 1°C (Figure 1G, p < 0.005, Figure 1H, p < 0.001) than at the two other temperatures. Indeed, ciliates and Gyrodinium sp. abundances, strongly declined at 6 and 10°C at the end of the experiment, suggesting predation effects at these higher temperatures (Figures 1G,H). Figure 1. Dynamics overtime of chlorophyll a concentration (A); bacterial abundance (B); viral abundance (C); VBR (viral bacteria ratio) (D); phototrophic pico/nanoflagellate (E); heterotrophic pico/nanoflagellate (F); ciliate abundance (G); Gyrodinium abundance (H). Each point represents the averaged ±SE of six replicate values for each variable at different temperature treatments. In summary, our results showed that the abundances of viruses, heterotrophic and phototrophic pico/nanoflagellates increased at the 6°C treatment from the middle to the end of the experiment (Figures 1C,E,F), while Chl a was greatest at 1°C during the whole experiment (Figure 1A). And, ciliates and Gyrodinium sp. abundances increased rapidly at the higher temperature treatments (6 and 10°C) only to decline at the end of the experiment maintaining higher abundances only at the lowest temperature (Figures 1G,H). Bacterial production increased along the experiment for all treatments, reaching the highest values in the 10°C treatment (Figure 2A). Thus, BP varied from 0.8 μg C L-1 d-1 at temperature = 7.7°C and pCO2 = 246.6 μatm to 13.0 μg C L-1 d-1 at temperature = 10.4°C and pCO2 = 2318.3 (μatm (Supplementary Table S2), increasing with temperature (n = 32, R2 = 0.18, p = 0.02) and pCO2 (n = 33, R2 = 0.41, p < 0.0001). Analysis of covariance revealed that BP increased significantly with pCO2 in the 6°C, and 10°C treatments but with a steeper slope at 10°C (Figure 3A and Table 1). It was further revealed that the effect of pCO2 on BP was stronger than the effect of temperature (Table 2). Figure 2. 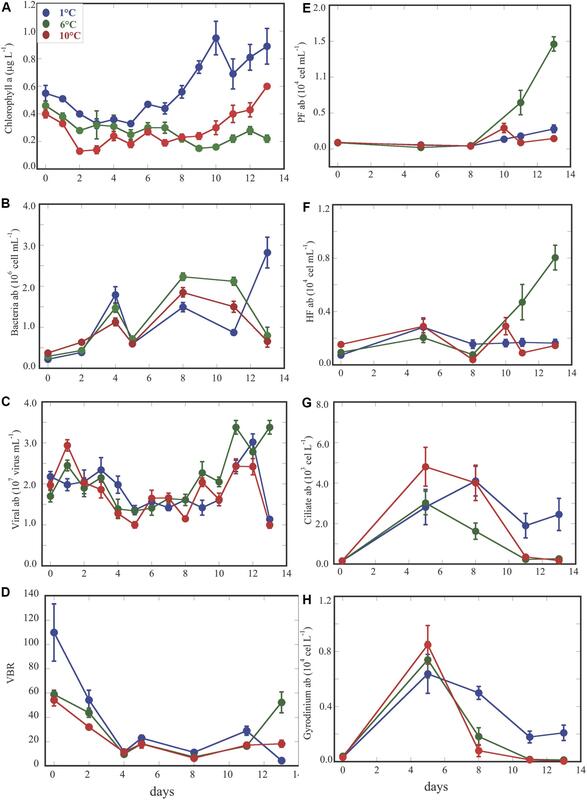 Dynamics over time of bacterial production (BP) (A); bacterial grazing rates (B); bacterial mortality rates due to viruses (C); viral lytic and lysogenic production at 1°C (D), 6°C (E), and 10°C (F). Circles and squares, represents the averaged ± SE of each of the two groups of triplicate values for each variable submitted to different temperature treatments and exposed to the corresponding CO2 concentration. Figure 3. Relationship between increasing pCO2 and BP (A), Lysogenic viral production (LysoV P) (B), percentage of bacterial losses by protists (%BAGZ, d-1) (C). Each point represents the averaged ±SE of each one of the two triplicates values for each variable submitted to different temperature treatments. Empty symbols correspond to variables that did not show significant relationships, and full symbols correspond to variables that showed significant relationships for the different temperature treatments. Table 1. Regression relationships for the natural log transformed bacterial production (BP, μg C mL-1 d-1), percentage of bacterial removed by grazing (%BAGZ, d-1), and lysogenic viral production (LysoVP, viruses mL-1 d-1) to the natural log transformed pCO2 (μatm) for each temperature treatment (1, 6, and 10°C). Table 2. 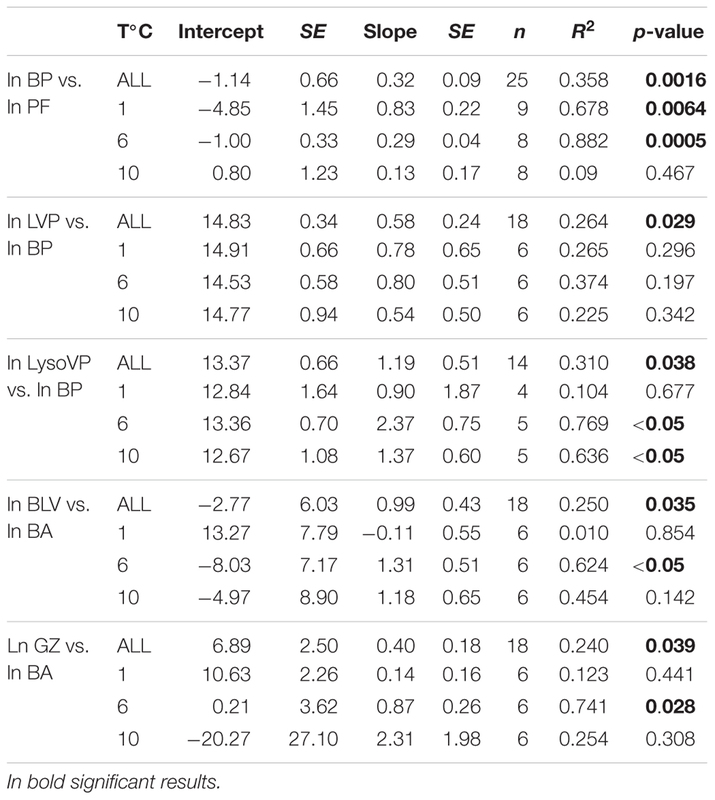 Analysis of covariance models relating natural log transformed bacterial production (BP, μg C L-1 d-1), percentage of removed bacteria by protists (%BNGZ), and lysogenic viral production (LysoVP, virus mL-1 d-1) to the covariate pCO2, and temperature treatments as well as the interaction between temperature and pCO2. Bacterial mortality rates due to protists and viruses responded opposite each other. Grazing rates (GZ) tended to increase along the experiment in the 6 and 10°C treatments (Figure 2B), while this trend was not evident for the rates of lysed bacteria (BLV, Figure 2C). Although, not statistically significant both processes showed an opposite trend (Supplementary Figure S2). Furthermore, GZ presented higher values than BLV, except for two cases at temperature = 9.9°C and at pCO2 ( = 902.3 μatm, and at temperature = 2.3°C and at pCO2 = 1382.3 μatm (Supplementary Table S2 and Supplementary Figure S2). Whereas, grazing rates and BLV were independent of pCO2 and temperature (p > 0.05), the percentage of bacteria removed by grazers was negatively and positively related to pCO2 at 1°C and at 6°C, respectively (Table 1 and Figure 3C), and in the covariance analyses, the interaction between pCO2 and temperature had a positive effect on the percent of bacteria grazed by protists (Table 2). Lytic viral production (LVP) tended to increase at 1°C along the experiment (Figure 2D) and was maintained or decreased at day 13 for the other two temperatures (Figures 2E,F and Supplementary Table S2). LVP exceeded LysoVP in 12 out of 18 cases (Supplementary Table S2), from 2 up to 15 times (Figures 2D–F and Supplementary Table S2), and was independent of pCO2 and temperature (p > 0.05). However, in the remaining four cases LysoVP exceeded lytic viral production up to 6 times. LysoVP displayed increasing values throughout the experiment at 10°C (Figure 2F) while decreasing at 1°C (Figure 2D). In addition, LysoVP was significantly positively related to increasing pCO2 (pCO2: n = 13, R2 = 0.52, p < 0.005), but when examining the relationship between LysoVP and pCO2 at different temperatures, this was only significant for the 10°C temperature treatment (Figure 3B and Table 1). Analyses of covariance showed that LysoVP was significantly affected only by pCO2 (Table 2). Here, we use regression analyses to describe the relationship between different microbial variables. Thus, how changes of phytoplankton affected BP, and changes of BP influence other microbial processes. So, we obtained that BP was not significantly related with Chl a concentration, that tend to decrease at the 6 and 10°C treatments with respect to the 1°C treatments, where BP increased (Figure 1B and Supplementary Table S2). Whereas, BP significantly respond to changes of abundances of phototrophic pico/nanoflagellates (PF, mainly Pyramimonas sp. ), mainly when considering all of the temperature treatments (Figure 4A and Table 3), though significant trends were observed in the 1 and 6°C treatments, and not at all for 10°C. Notice that the 1°C treatment had the strongest response (Figure 4A and Table 3). Next, changes of viral lytic and lysogenic production were significantly related to variations of BP across temperature treatments (Figures 4B,C and Table 3). However, LysoVP was significantly related with BP in the 6°C and at 10°C treatments (Figure 4C and Table 3). Finally, bacterial mortality rates (by grazing and viral lysis) significantly responded to variations of bacterial abundance across all temperature treatments, but when considering them separately this relationship was only significant for the 6°C treatment (Figures 4D,E and Table 3). Figure 4. Relationship between: BP and phototrophic pico/nanoflagellates (PF) (A); lytic viral production (LVP) and BP (B); lysogenic viral production (LysoVP) and BP (C), bacteria lysed by viruses (BLV) and bacterial abundance (BA) (D); grazing rates on bacteria (GZ) and BA (E). The black line corresponds to the regression line for the whole experimental data set, and color lines show the significant regressions between different variables. Each point represents the averaged ± SE of each of the two groups of triplicate values for each variable submitted to different temperature treatments and exposed to the corresponding CO2 concentration. Full and empty symbols represent the same as in Figure 3. Table 3. Regression analyses between ln bacterial production (BP, μg C mL-1 d-1) and ln phototrophic pico/nanoflagellate (PF, cells mL-1), ln lytic viral production (LVP, virus mL-1 d-1) and ln BP; ln lysogenic viral production (LysoVP, virus mL-1 d-1) and ln BP; ln grazing rates on bacteria (GZ, cells mL-1 d-1) and ln bacterial abundance (BA, cells mL-1); ln bacteria lysed by viruses (BLV, cells mL-1 d-1) and ln BA, covering the whole temperature (ALL) and for each temperature treatment (1, 6, and 10°C). One of the main limitations of experimental studies such as this one is to simulate projected changes that will occur over large timescales. A common concern is that short-time manipulations cannot simulate properly the effect of long-term adaptation likely occurring in natural systems and are therefore biased. However, with our experimental approach we did not pretend to mimic nature, indeed we used the experiment as a tool to help interpret how the microbial plankton could respond to environmental stressors. Furthermore, it must be noticed that, Arctic communities already experience large abrupt seasonal changes that are not experienced by many temperate oceanic communities, including rapid seasonal warming. Available sea surface temperature data from NOAA’s Climate Prediction Center2 corresponding to the last 2 decades for the study area (Svalbard Isfjorden) show an annual variation of 6–7°C, ranging from approximately 1–7°C, very similar to the values detected in situ in the North of Svalbard (-1.2–7°C) (Boras et al., 2010, ATOS-I cruise). Thus, the temperature range selected for this experiment (1–10°C) encompassed the range of temperatures experienced by the local plankton community over the year plus 2–3°C increase. Then, this increase will cover the projected range of temperatures expected in the Arctic Ocean in the coming century (ACIA, 2004). Experiments attempting to control pCO2 in Arctic plankton communities have shown this to be an inherently difficult task (e.g., Torstensson et al., 2012; Engel et al., 2013) because the experimental subject, i.e., plankton community, contributes to variation in pCO2. Even in the field, Arctic plankton communities have been shown to drawdown pCO2 by as much as 200 ppm during the spring plankton bloom (Holding et al., 2015). Hence, active plankton growth would deplete CO2 faster than mass flow controllers would be able to restore target values, leading to large downward fluctuations, when high concentrations of CO2 were applied. Likewise, periods of high respiration, particularly under high temperature, led to elevated CO2 even if low concentration of CO2 is bubbled, along to the increase in pCO2 due – for a given mass of CO2 present in the water – to warming alone. This could explain the high variability in pCO2 obtained within the two groups of triplicates in each temperature treatment (Supplementary Figure S1). That, precluded to establish “low” and “high” pCO2 fixed conditions and instead to treat pCO2 as a continuous variable with a gradient-basis design following Holding et al. (2015) at concentrations ranging from 135 to 2318 μatm. Whereas, the pCO2 range observed in the Arctic Ocean across the Greenland Sea and the North of Svalbard during the ATOS-1 cruise, was between 134 and 260 μatm (Alvarez, personal communication). Nevertheless, when examining the relationship between BP and pCO2 from data derived experimentally and in situ surface pCO2 and BP (Alvarez, unpublished results, Boras et al., 2010, respectively) within similar temperature ranges (≤7.0°C), both in situ and experimental data fall within the confidence limits of the experimentally derived relationship between BP and pCO2 (Figure 5). The consistency of this relationship considering both scenarios, revealed that CO2, directly or indirectly through phytoplankton, could have a strong influence on BP. Figure 5. Combined BP and pCO2 data of both experiments (filled circles) and the summer ATOS-I cruise (open circles). Solid line represents the relationship of the experimental data from the 1 to 6°C temperature treatments [Log BP = –2.58 (±0.86) + 0.52 (±0.13) log pCO2; n = 21; R2 = 0.438; p < 0.003] and the dashed blue and red curves represent the 95% confidence limits for the regression equation and regression estimates, respectively. Our experimental data show that warming (6°C and 10°C) at increasing pCO2 enhances BP in these Arctic waters. Indeed, we think that variations of primary producers subjected to increasing pCO2 and temperature probably contributed to changes in BP. As in the same experimental set up Holding et al. (2015) found that the effect of fertilization of CO2 did not increase further, beyond 6°C, with a steeper slope at 1°C (almost twice) than at 6°C. This is, that the higher temperatures of 10°C promoted a decrease of net primary production and increased respiration (Holding et al., 2013), due to phytoplankton taxa shifting from larger to smaller cell size cells (Coello-Camba et al., 2014) and the associated release of dissolved organic matter, favoring BP, as is shown in Morán et al. (2006). This fact, is also reflected by a lack of relationship at 10°C between BP and abundance of phototrophic pico/nanoflagellates (Figure 4A, i.e., Pyramimonas sp., Prasinophytes class; Coello-Camba et al., 2014). The PF are the main representative primary producers at the time of the experiment and significantly related with BP at 1 and 6°C (Figure 4A). The small Prasinophytes achieved high abundances at 6°C, in detriment of other taxa (Coello-Camba et al., 2014), only to decrease again at 10°C (Figure 1E), as was also described in a previous experiment by Lara et al. (2013) in Svalbard, where the most abundant genus was Micromonas sp. This fact agrees with the finding of Lovejoy et al. (2007), and Vaqué et al. (2008) when in the Arctic Ocean, blooms of picoprasinophytes and/or Micromonas were observed during spring and summer. With respect to the increase of BP, Davidson et al. (2016) showed that the Antarctic heterotrophic bacterial communities were more active and diverse at higher CO2 concentrations, which was attributed to the increase in compounds from phytoplankton for bacterial to growth (Piontek et al., 2013). Also, Lindh et al. (2013) in mesocosms experiment done in the Baltic Sea, and Keys et al. (2018) in the English-channel found that the increase of BP derived from changes of bacterial communities, favoring different phylogenetic types when subjected to warming and acidification. Next, changes in BP production in these Arctic waters, were expected to be propagated to other microbial processes, such as viral lytic production and lysogeny, and bacterial mortality rates. Although, we are not aware of any other experimental study combining the effect of increasing pCO2 together with warming on bacterial losses by protists or viruses to compare with, there are several studies describing these effects of warming and/or pCO2 separately on these bacterial mortality. During our experiments grazing rates at different temperature treatments slightly increased after the 5th day at 6°C (Figure 2B). This effect of warming on bacterial mortality was also observed as in experimental as well as in situ samples of Antarctic marine communities (Vaqué et al., 2009; Sarmento et al., 2011) and Arctic waters (Lara et al., 2013). On the other hand, it is also described that low in situ temperature in high latitudes constrained the growth of heterotrophic protists on bacteria and phytoplankton (Rose and Caron, 2007). Furthermore, we also observed that bacterial mortality due to grazing was almost always higher than that caused by viral lysis, mainly at 6°C (Figures 2B,C). These results agree with other studies both, in situ where Maranger et al. (2015) reported a stronger temperature-control on grazing rates compared to bacterial lysis rates in a pan-arctic study, as well as in warming controlled experiments (Lara et al., 2013). In contrast, Vaqué et al. (2017) showed that BP and mortality rates due to viruses were more sensitive to temperature than grazing activity in Antarctic regions. Regarding the effect of pCO2 on viral lysis rates, Larsen et al. (2008) and Brussaard et al. (2013) reported that the activity of virioplankton on phytoplankton did not show a clear response to increasing pCO2 in an Arctic mesocosm experiment. Danovaro et al. (2011) suggested that viral abundance responses maybe mediated by the effects of pH and consequently to pCO2 on the host organisms: bacteria, archaea, protists and metazoan. Indeed, the rate of lysed bacteria in our experiment seems to be mainly dependent on the host communities (Figure 2D) rather than directly on pCO2 and/or temperature. 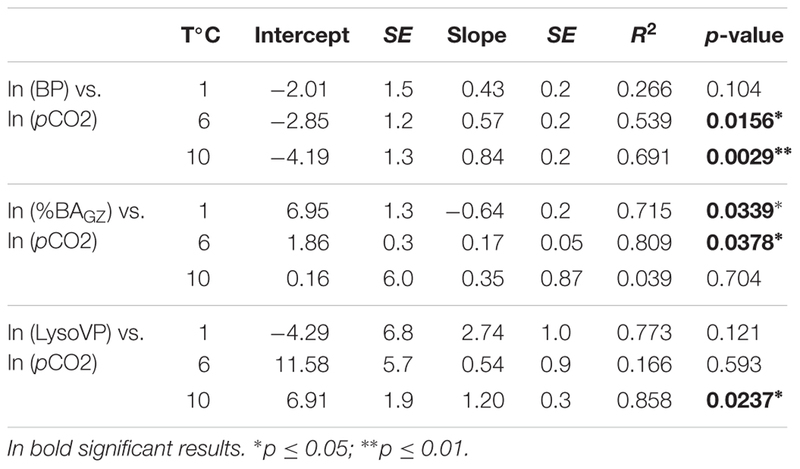 While percentage of removed bacteria by protists seems to be affected by both temperature and pCO2 (Table 2). It is described that lysogeny should be the dominant viral life strategy in oligotrophic systems (Jiang and Paul, 1994; Danovaro et al., 2011, and references therein) as is the case in Isfjorden at the sampling time, which is characterized by low temperature (1.4°C), low phytoplankton Chla (0.6 ± 0.06 μg L-1), low bacterial abundance (2.2 ± 0.4∗105 cell mL-1) and low BP (1.7 μg C L-1 d-1) (Figures 1A,B and Supplementary Table S2). However, our results showed more lysis at low than at high temperature treatments. Indeed, in our experiment lysogeny significantly increased as pCO2 increased at 10°C in parallel with BP (Table 1 and Figures 2A,F). In addition, lysogeny was significantly related with BP at 6 and at 10°C temperature treatments, and not at all at 1°C (Figure 4C and Table 3). These results agree with the proposed Piggyback-the–Winner model by Knowles et al. (2016) where lysogeny should be even more successful than the lytic cycle when bacterial hosts are growing well. Here, we suspected, as is shown in Lindh et al. (2013) that warming and increased CO2 will promote the selection of specific bacterial communities, responsible for high BP. And, Knowles et al. (2016) assume that viruses “exploit” their hosts (that are presumably highly active bacteria) through lysogeny instead of killing them, making it advantageous for both of them; the prophage is propagated to the new bacteria generation, protects the host for a new viral infection (Levin and Lenski, 1983) and predation by grazers (Brüssow, 2007). Furthermore, in the 1°C treatment, where we detected lower BP than at higher temperatures, the lytic cycle was more important than lysogeny (Figures 2A,D–F). The observations of more cases of lysogeny at warmer than at the lower temperature treatments, and its increase at increasing BP suggests a decreasing flow of bacterial carbon entering in a dissolved phase via the viral shunt (lysed bacteria), thereby favoring the microbial loop (grazing on bacteria). This indicates an enhancement of heterotrophic biomass and processes relative to phototrophic processes with warming, as previously reported, based on temperature manipulations described by Holding et al. (2013) and Lara et al. (2013). Our experimental results provide evidence that possible future changes in pCO2 and temperature in the Arctic Ocean may lead to increased bacteria production, probably triggered by changes in primary producers that will be propagated to other microbial activities. 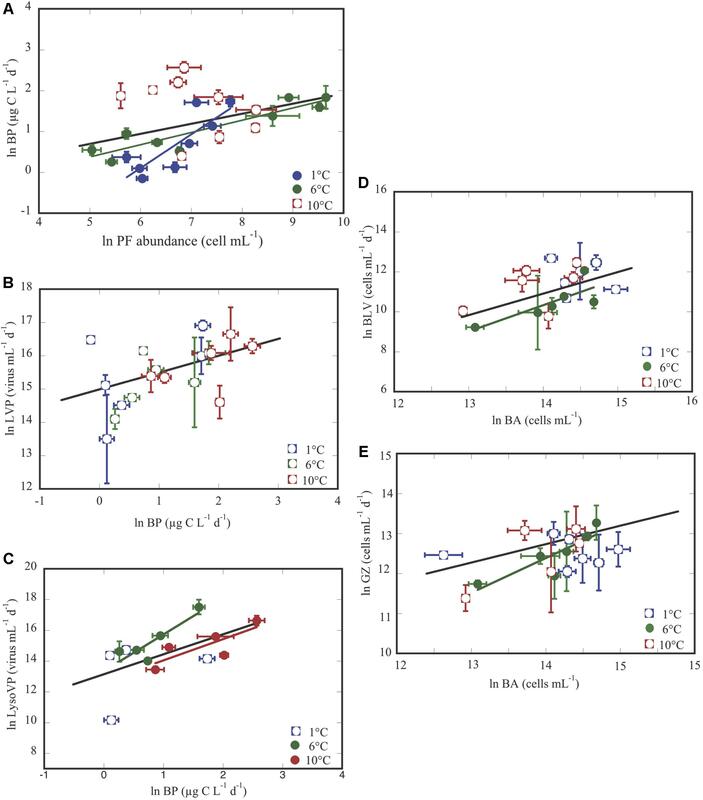 The increasing pCO2 and temperature is additive in the case of BP, and their effect on the relative flow of bacterial carbon through grazers (protists) depends on their interaction. Next, the increase of BP enhanced lysogeny more than viral lysis, which will create changes in the carbon fluxes within the microbial food web, evidenced by the higher bacteria mortality rates due to protists than to viruses. While the current debate on the responses of the Arctic to the expected changes of temperature and pCO2 are focused only on primary production, our experiments suggest that increased heterotrophic BP, and decreased phytoplankton biomass, in a warmer more acidic Arctic, may lead to a reduced net community production, which will be translated in a weakening CO2 sink capacity of the Arctic plankton community. However, there is a need of more experimental and field studies that will encompasses different seasonal situations and long time period to corroborate these poor expectations. DV and EL designed and coordinated this study, collected samples for viruses, bacteria and protists, performed mortality experiments, analyzed the results, and wrote the manuscript. JA designed and implemented the whole experimental set up, responsible for bacterial abundance and production measurement. JH helped in the data analyses and in the elaboration of the manuscript. ES collaborated in the setup of the experiments, in the daily sampling, and in the lab. IH helped in the implementation of the CO2 bubbling system. AC-C collaborated in sampling, in the chlorophyll a determination and phytoplankton cells count. MA contributed with CO2 data from ATOS-I cruise. SA coordinated the phytoplankton study and sampling, its analysis and identification. PW was the PI of the ATP project, making possible the use of facilities in UNIS (Sbalvard) to carry out the experiments, and added valuable advice to the study. CD coordinator of the ATP project (CSIC), provided a creative environment and added constructive criticisms throughout the study revising and editing the manuscript. All authors commented and discussed the obtained results, and suggested improvements on the manuscript. This study was funded by the project Arctic Tipping Points (ATP, contract #226248) in the FP7 program of the European Union. EL was supported by a grant from the Spanish Ministry of Science and Innovation. We thank R. Gutiérrez and I. Garcia-Zarandona for help in the lab, the crew of the RV “Viking Explorer” for helping with sampling, E. Halvorsen for logistic support, and The University Centre in Svalbard, UNIS, for hospitality. ACIA. (2004). Impacts of a Warming Arctic: Arctic Climate Impact Assessment. Cambridge: Cambridge University Press. Bates, N. R., Moran, S. B., Hansell, D. A., and Mathis, J. T. (2006). An increasing CO2 sink in the arctic ocean due to sea-ice loss. Geoph. Res. Lett. 33:L23609. Coello-Camba, A., Agustí, S., Holding, J., Arrieta, J. M., and Duarte, C. M. (2014). Interactive effect of temperature and CO2 increase in arctic phytoplankton. Front. Mar. Sci. 1:49. Dickson, A. G., Sabine, C. L., and Christian, J. R. (eds) (2007). Guide to Best Practices for Ocean CO2 Measurements, vol. 3. Sidney, BC: PICES Special Publication. Guixa-Boixereu, N. (1997). Abundància I Dinàmica Dels Virus En Ecosistemes Planctònics. Doctoral Thesis, Universitat de Barcelona, Barcelona. Kirchman, D., Knees, E., and Hodson, R. (1985). Leucine incorporation and its potential as a measure of protein-synthesis by bacteria in natural aquatic systems. Appl. Environ. Microbiol. 49, 599–607. Kirchman, D. L. (1993). “Leucine incorporation as a measure of biomass production by 96 heterotrophic bacteria,” in Handbook of Methods of Aquatic Microbial Ecology, eds P. F. Kemp, B. F. Sherr, E. B. Sherr, and J. J. Cole (Boca Raton: Lewis Publishers), 509–512. Levin, B. R., and Lenski, R. E. (1983). “Coevolution in bacteria and their viruses and plasmids,” in Coevolution, eds D. J. Futuyma and M. Slatkin (Sunderland: Sinauer). Marie, D., Brussaard, C. P. D., Thyrhaug, R., Bratbak, G., and Vaulot, D. (1999). Enumeration of marine viruses in culture and natural samples by flow cytometry. Appl. Environ. Microbiol. 65, 45–52. Meehl, G. A., Stocker, T. F., Collins, W. D., Friedlingstein, P., Gaye, A. T., Gregory, J. M., et al. (2007). “Global climate projections,” in Climate Change 2007: The Physical Science Basis. Contribution of Working Group I to the Fourth Assessment Report of the Intergovernmental Panel on Climate Change, eds S. Solomon, D. Qin, M. Manning, Z. Chen, M. Marquis, K. B. Averyt, et al. (Cambridge: Cambridge University Press), 749–845. Parsons, T. R., Maita, Y., and Lalli, C. M. (1984). A Manual of Chemical and Biological Methods for Seawater Analysis. Oxford: Pergamon Press. Pierrot, D., Lewis, E., and Wallace, D. W. R. (2006). MS Excel Program Developed for CO2 System Calculations. ORNL/CDIAC-105a. Oak Ridge: Carbon Dioxide Information Analysis Center. Sherr, B. F., Sherr, E. B., and Fallon, R. D. (1987). Use of monodispersed, fluorescently labeled bacteria to estimate in situ protozoan bacterivory. App. Environ. Microbiol. 53, 958–965. Sieracki, M. E., Johnson, P. W., and Sieburth, J. M. (1985). Detection, enumeration, and sizing of planktonic bacteria by image-analyzed epifluorescence microscopy. App. Environ. Microbiol. 49, 799–810. Smith, D. C., and Azam, F. (1992). A simple, economical method for measuring bacterial protein synthesis rates in seawater using 3H-leucine. Mar. Microb. Food Webs 6, 107–114. United States Environmental Protection Agency [USEPA] (2013). Future of Climate Change. Available at https://19january2017snapshot.epa.gov/climate-change-science/future-climate-change_.html. Copyright © 2019 Vaqué, Lara, Arrieta, Holding, Sà, Hendriks, Coello-Camba, Alvarez, Agustí, Wassmann and Duarte. This is an open-access article distributed under the terms of the Creative Commons Attribution License (CC BY). The use, distribution or reproduction in other forums is permitted, provided the original author(s) and the copyright owner(s) are credited and that the original publication in this journal is cited, in accordance with accepted academic practice. No use, distribution or reproduction is permitted which does not comply with these terms.